Sensing Soil Moisture: You’re Doing it Wrong! If you compulsively search online for inexpensive microcontroller add-ons, you will see soil moisture measurement kits. [aka] built a greenhouse with a host of hacked hardware including lights and automatic watering. What caught our attention among all these was Step 5 in their instructions where [aka] explains why the cheap soil sensing probes aren’t worth their weight in potting soil. Even worse, they may leave vacationers with a mistaken sense of security over their unattended plants. The sensing stakes, which come with a small amplifier, work splendidly out of the box, but if you recall, passing current through electrodes via moisture is the recipe for electrolysis and that has a pretty profound effect on metal. [Aka] shows us the effects of electrolysis on these probes and mentions that damaged probes will cease to give useful information which could lead to overworked pumps and flooded helpless plants. There is an easy solution. Graphite probes are inexpensive to make yourself. Simply harvest them from pencils or buy woodless pencils from the art store. Add some wires and hold them with shrink tube, and you have probes which won’t fail you or your plants. Here’s some garden automation if this only whet your whistle, and here’s a robotic friend who takes care of the weeds for you. Composting serves an important purpose in our society, reusing our food scraps and yard waste to fertilize gardens rather than fill up landfills. Knowing that most people don’t compost, [Darian Johnson] set out to create a Arduino-controlled composting system to make it as simple as possible. It monitors your bin’s moisture, temperature, and gas emissions to ensure it’s properly watered and aerated. [Darian]’s project combines a MQ4 gas sensor that detects combustible gas, a soil moisture sensor, and a temperature and humidity probe. The nearby water reservoir is monitored by an ultrasonic sensor that keeps track of the water level; a pump triggered by a TIP120 turns on the water. Meanwhile, a servo-controlled vent keeps the air flowing just right. The Smart Composting System sounds like it would be useful to home gardeners; it’s a Best Product finalist in the 2017 Hackaday Prize. If you're teaching kids how to code, what do you do to show that software makes an impact in the real world? MIT has a clever idea: a robot garden. 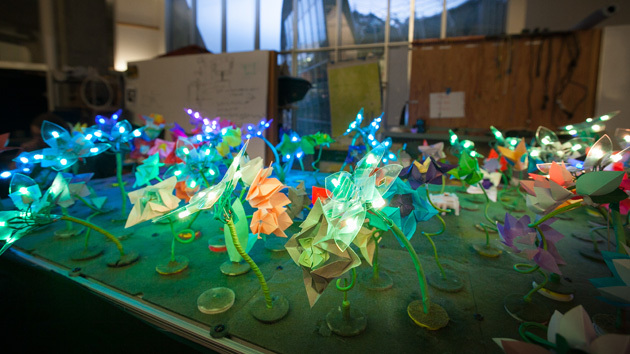 The project lets you control a grid of Arduino-linked "plants" through programming that makes them blossom and light up in pretty (and occasionally mesmerizing) ways. It'll even teach the virtues of distributed computing -- you can tell these leafy robots to bloom or change color in algorithm-driven sequences. The garden is just a demo for now, but it'll eventually turn into an easy-to-replicate curriculum for students who'd otherwise have to settle for seeing their results on-screen. It’s great having fresh vegetables just a few steps away from the kitchen, but it takes work to keep those plants healthy. [Pierre] found this out the hard way after returning from vacation to find his tomato plant withering away. He decided to put an end to this problem by building his own solar-powered plant watering system (page in French, Google translation). An Arduino serves as the brain of the system. It’s programmed to check a photo resistor every ten minutes. At 8:30PM, the Arduino will decide how much to water the plants based on the amount of sunlight it detected throughout the day. This allows the system to water the plants just the right amount. The watering is performed by triggering a 5V relay, which switches on a swimming pool pump. [Pierre] obviously wanted a “green” green house, so he is powering the system using sunlight. A 55 watt solar panel recharges a 12V lead acid battery. The power from the battery is stepped down to the appropriate 5V required for the Arduino. Now [Pierre] can power his watering system from the very same energy source that his plants use to grow. AGponics is an Arduino-controlled modular aquaponics system. If you’ve ever walked around West Oakland, farming probably doesn’t come to mind. That’s because it’s the fifth busiest shipping port in the United States. But that hasn’t stopped maker Eric Maundu from feeding himself with locally-grown food from his aquaponic gardens, a combination of fish farming and hydroponic planting. Frequently proclaiming, “I am not a farmer,” Eric has applied his robotics and software background to making gardens smart. @JarroseLaPlante is an installation created by Félicien Goguey and Thomas Meghe. This plant has a twitter account, you can water it by direct tweets. Since a single tweet can’t save her, she needs twitter friends to grow up! A Processing application listens to new tweets via Twitter APIs. A servo motor is bringing water to the plant while sensor checks its the humidity rate (if it’s too low the plant tweets in order to alert her followers). If you follow the plant’s account, she can send you private messages. Go here to visit the plant. And do not forget to water it! [Instrument Tek] isn’t messing around with a hobby-sized greenhouse. In fact if it were any bigger we’d call it a commercial operation. But what interests us is the professional-quality greenhouse automation he built around and Arduino board. The greenhouse is about what you’d expect to see at a nursery, except the footprint is somewhere around 10′x10′. It’s a stick-built frame with walls made of poly. Professional greenhouses monitor and regulate temperature and humidity and this one does just that. The video after the break starts off by showing the controller box. It has temperature, humidity, and light sensors that allow the Arduino to judge growing conditions. If it gets too hot, some slats are opened and a fan exhausts air from the structure. If it gets to cold, a series of light fixtures are energized. They contain heat lamps, as this setup is in northern Alberta, Canada and it can get quite cold some nights. The drip system is also automated, with a solenoid to turn water on and off. In addition to that 3:26 show-and-tell, we’ve embedded a 27-minute video that shows how to build the controller box. So you can start you plants indoors on the rack, then populate the greenhouse when they get large enough. Starting your garden indoors helps to ensure large yields. This is because the plants get a head start before it’s warm enough for them to be put in the ground. But the process involves a fair amount of labor, ensuring that the lights are turned on and off at the right times each day, and that the temperature for germination and growth, as well as humidity, hit a certain target. It’s obvious that a bit of automation would be nice, and this Arduino-based garden nursery does just that. One of the things that sets this project apart is that it shows you how to go from an empty room to the bounty of plant starters seen here. For the most part the equipment is what you’d expect, seed trays and covers, tray warming mats, and fluorescent light fixtures. the whole thing is given a small footprint thanks to an adjustable shelving unit. The Arduino is used in conjunction with a Sprout Board to add connectivity for switching the lights and warming mats. This is just a matter of driving a relay to switch mains voltage and can take any number of forms, including this home automation project we saw the other day.